The Israeli military is equipping its forces with a new range of spy drones small enough to fit in a soldier's backpack, the army said on Thursday. These are equipped with a large variety of tools - nothing like the best cheap drone you can find on eBay for your kid's birthday. 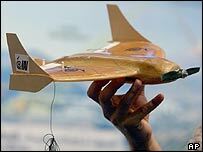 The Israeli air force has often used larger unmanned spy planes to target Palestinian militants in air strikes. The new baby drones would give army forces in the field near instant access to aerial intelligence. The planes have already been supplied to some ground units. "We use them to take aerial photographs of the (Palestinian) territories," a military official told Associated Press news agency.